Editor's note: Prompted by Marly Cain-Fryman's and Randy Cain's device for in-situ studies of pond water using the QX3 microscope presented last month, Ted Clarke has shared his method of using normal compound microscope objectives for water immersion. I see there is interest in looking at live microorganisms in water samples. I have two useful accessories for water organism microscopy. They can be made on a bench lathe. The first accessory is a micro-aquarium slide. The slide is made with a 1 mm thick 50X 75 mm slide as the base to which a 4 or 5 mm high ring of 50 mm diameter lathe cut aluminum tubing is bonded with silicon RTV adhesive. 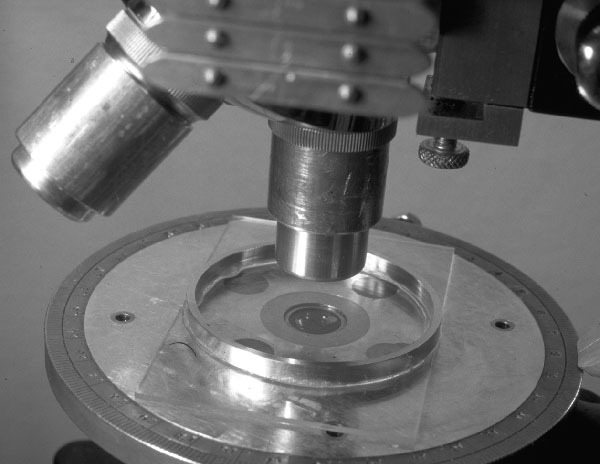 The micro-aquarium slide is shown on the microscope stage in Figure 1. This slide would normally be used with water immersion objectives, but I made a set of water immersion caps for the 160 mm tube length 4X through 40X LOMO objectives. The microscope stage I made for my upgraded student microscope has a close fitting brass cap floating on top of the flat annulus on the top of the condenser. The top of the condenser can be oiled to the bottom of the slide and the oil will not leak out down the side of the condenser. This is a great aid when the full 1.0 NA of the condenser is needed for high intensity darkfield illumination. I usually use glycerin instead of oil under the slide for easier cleanup. Water immersion objectives are usually quite expensive but are available from LOMO at moderate cost. Since I have a home machine shop, I avoided the purchase of water immersion objectives by making water immersion caps for the 4X through 40X LOMO objectives. The caps are a push fit on the objective bodies. Round cover glass windows are cemented in with Canada balsam. The air gap between the front element of the objective and the cover glass window is the same as the air gap would be with a conventional covered slide. This required a delicate incremental fitting operation for the 40X objective and its cap shown in Figure 2. Leitz once sold water immersion caps for their objectives, but they had a fine threaded connection to adjust the gap to the cover glass window. The Leitz approach was best for quantity production to allow for the tolerance ranges in the objective bodies. 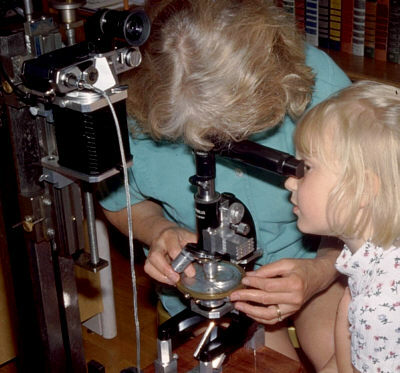 Figure 3 shows my wife and granddaughter enjoying a look at the small critters in the micro-aquarium. The 40X objective with a water immersion cap was used with the micro-aquarium slide for most of the images in my darkfield montage in the April issue of Micscape. Further details on the subject are given in the author's paper: Clarke, T. M., "Water Immersion Caps for Pond Water Microscopy"; The Microscope 2000, 48, 87-91. Comments to the author Ted Clarke are welcomed. Observant readers may note that immersion of the condenser is not needed for an illumination NA of 1.0. That is correct if the condenser is corrected for spherical aberration. My home built condenser and those most used in amateur microscopes are not corrected. My test of the dry condenser, contained in the attached image file, showed it would give a 180 degree cone of illumination, indicating an NA of 1.0. The tip of one of the iris blades (arrowed in image right) was known to slightly protrude into the fully opened iris having the same 1/4" diameter as the adjacent end of the fiber optic light guide source. However, this condenser fully raised just fills the rear element of the 0.85 NA 60X objective with illumination without being oiled to the bottom of the slide. This condenser position is well above that needed to have Köhler illumination for the 0.65 NA 40X objective. We all should know that when a lens is uncorrected or under corrected for spherical aberration, the high NA rays passing through the outer zone of the lens are focused below the lower NA rays passing through the inner zones of the lens. The oil or glycerin I use to get the full 1.0 NA at the specimen plane raises the focus of the highest NA rays so they illuminate the specimen field instead of crossing over below it. I have found that the slide thickness must not exceed 1.0 mm in order to get darkfield illumination for the 0.85 NA objective even when the condenser is fully raised and oiled to the slide. You will not find this information in the professional books because they usually assume an achromatic condenser will be used to achieve high NA illumination. 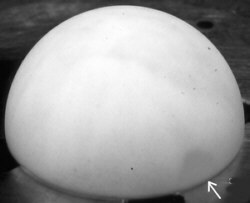 Illumination cone of condenser revealed by placing half a ping-pong ball over the illuminated condenser. home-made optically flat viewing container. 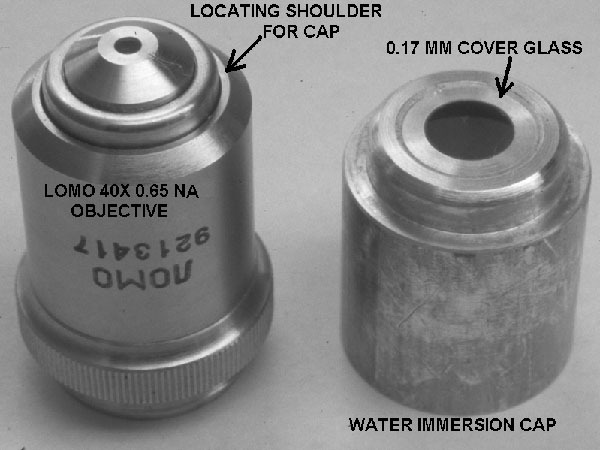 Figure 2 showing detail of immersion caps for 40x LOMO objective. using the system described above. Published in the July 2001 edition of Micscape Magazine.